TO THE ATTENTION OF THE COOLER MASTER's SOFTWARE ENGINEERS. The CM Trigger Z software (latest version 1.3.4) has serious problems with the "Keyboard Layout" configuration. I have read in this forum that the software set the keyboard layout upon the installed Windows language version. I found it very stupid (no pun intended) because I could have an English version of Windows installed (I work with foreign customers and I use the English language) but an Italian (layout) keyboard or I could have a German version of Windows installed and a French (layout) keyboard, etc. A better behavior would be if the software will set the keyboard layout based on the Windows 'default input method' chosen by the user (that's the Windows keyboard layout preferences). Besides this how could you haven't implemented a manual switch that let the user choose his keyboard layout? It's truly incredible that the software engineer that made the Trigger Z application had not done this. I have an international English Windows installed and I have the Trigger Z with the 105 Italian layout: let me explain how I can change the keyboard layout in the CM Trigger Z software, because it's always display the 104 English layout. Don't tell me that I've to install the Italian Windows version because this isn't a solution but a remedy to the poor planning and approximate state of the software you've created. And don't try to tell that this Keyboard is out support because is listed in the Cooler Master web site (http://www.coolermaster.com/peripheral/keyboards/triggerz/) as of today. In fact I have bought it (new-sealed) last week because I prefer this keyboard to the newer ones (MasterKeys Pro for example): the Trigger Z has 5 distinct macro keys on the left and a palm rest that the new keyboard doesn't have. P.S. : I have modded the 'exe' and the 'ini' file with only partial success (the software display the Italian layout but when you choose the keys near the 'enter' button it doesn't function correctly - 104 layout is different from 105 layout). I have no idea if it's the same for Trigger-Z, but the Trigger (non-Z) software uses the non-Unicode system locale language to determine the keyboard language/layout. For example, I set my system locale to Japanese (Japan) for certain applications and the CM Trigger software will show Japanese notification + JP keyboard layout when it launches. 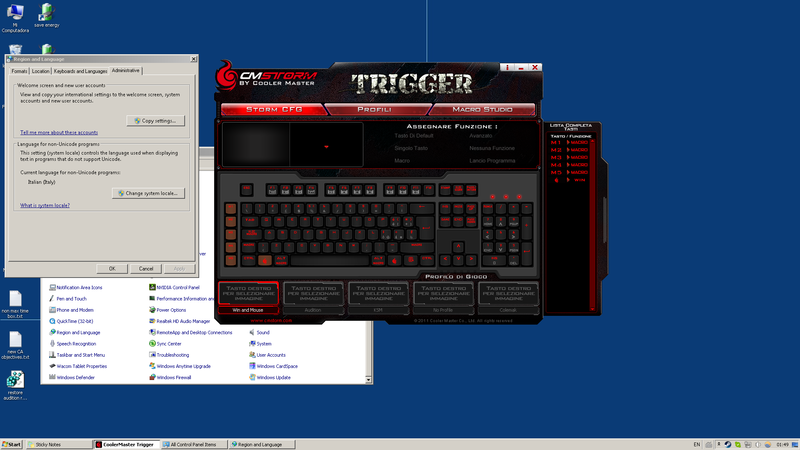 I am using English Windows version and English - US input, and my CM Storm Trigger is ANSI US layout. Not sure if it will be the same in your situation, but I hope you find a solution. â€‹I have Windows 10 Professional (International English) and the input (keyboard) language is set to Italian (as the layout of my Trigger Z) - so all the keys correspond to the physical layout of the keyboard. Here lies the problem, the CM Trigger Z software (latest version 1.3.4) display the layout (of the keyboard) based on the Windows' installed language (in my case International English) and not upon the Windows 'default input method' chosen by the user (that's the Windows keyboard layout preferences). It seems that no Cooler Master's software engineer have answered because the truth is that (for them) this product is dead (even if you can find it in the retail channel, and let me say that it's a lot better than the new keyboards they build). I don't think that it will take more than 5 minutes to implement in the CM Trigger Z software application a manual switch that let the user choose the preferred layout. If I had the source code I'll made it by myself. Great support from Cooler Master!!! Did you try changing the non-Unicode system locale? I also have English Windows but I can change the layout to JP or Italian in Trigger software by changing the system locale language. (Control Panel, Region and Language, Administrative tab, Language for non-Unicode programs - Change system locale). Changing keyboard layout option for Windows doesn't change it and there's no option for it in Trigger software itself. Like I said before, I don't have Trigger-Z so I can only speak for Trigger software.